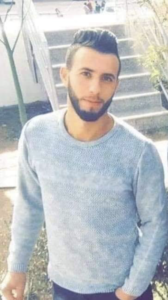 Ahmad Jamal Manasrah is the fourth young Palestinian gunned down in cold blood in the West Bank by Israeli occupying forces just in the past 24 hours. He was not protesting but driving near Bethlehem. In a genocide, existence is a capital offense. May he Rest In Peace. Build BDS & Palestinian solidarity in his memory. What’s with this calling John McCain a ‘decorated war hero’ just because Trump criticized him? He bombed the Vietnamese over & over again on 23 different bombing missions in one of the most despised & opposed wars in human history & he supported every US war after that. He called the Vietnamese ‘gooks’ while those in his generation who marched for civil rights & against that war called them brothers & sisters. He’s nobody’s hero. He’s a war criminal. There’s a new book getting a lot of media attention about Jared Kushner & Ivanka Trump’s “rise to power in the White House.” Nepotism is not a ‘rise to power’. They did not have to do all the unscrupulous things other operatives do since they were both born to corruption. Looked at another way, the poor things never stood a chance. Somewhere there’s a fickle finger of fate flipping the bird at them. After all, would you want Donald Trump in your family? Repost from March 20 2017: This month marks the fourth year of Saudi-coalition carpet bombing of Yemen with support from the US & UK. It is the site of one of the glorious Arab Spring uprisings that saw women playing a leading role. We should pay tribute to their revolution & commit ourselves to rebuilding a principled antiwar movement because the current one has been corrupted by swallowing the rhetoric of the so-called ‘war on terror’ & has left the Yemenis to stand alone against the onslaught of bombers. 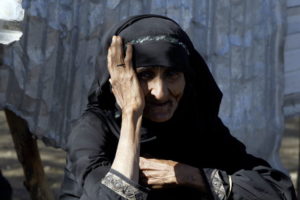 It’s been two years this month since the Saudi coalition of five monarchies & two military dictatorships began bombing democracy into Yemen, where in 2011 one of the most powerful Arab uprisings brought dictatorship to its knees–at least for a period. It was a hopeful period for humanity, with uprisings in Egypt, Bahrain, Syria, reverberations in Iraq, Morocco, Tunisia, & elsewhere. The setback of the Arab Spring by the most repressive military forces & think tanks aligned against them has brought the cynics, but mostly the Muslim-haters, out of the woodwork to sneer that Arabs would be capable of democracy, especially in those countries where women wear the veil. Yemen & Bahrain were led by fully-veiled women standing against tear gas & tanks & they played a central role in Egypt. But smart-asses whose most courageous acts are cursing at authorities under their breath dare to disdain them? The tragedy of the Arab Spring is the epic failure of international solidarity–& now the alignment of erstwhile progressives with Assad’s dictatorship & Russian bombing of civilians in Syria. It is not Arab activists who do not understand the character of democracy. It is mostly western progressives moving to the right led by Assad propagandists, retired CIA & FBI agents, & former US military officers who do not agree with uprisings against dictatorship or international solidarity–so profound is their hatred of Muslims & Jews. The Arab uprisings have not said their struggles are over nor conceded defeat. This is not the time for triumphal or smug obituaries. Until then, we stand with them & look to them as leaders & teachers in the struggle of humanity for a world suitable for human beings to live & love in–a place to come of age & grow to old age in peace. This women in Sana’a, Yemen is outside her tent shelter at a camp for those made homeless by Saudi-led, US & UK backed bombing. Well that didn’t take long: today, New Zealand prime minister Jacinda Ardern called for a “global response to the dangers of social media.” By which of course she means increased censorship at a time when social media is on a rampage of deleting & suspending the accounts of Palestinian & Kashmiri activists & their supporters. Social media is not the primary culprit in hate mongering against Muslims. Corporate media is a bastion of the stuff. So why didn’t she call for them to tone down the lies & hate mongering? Why didn’t she call on them to stop propagandizing for the so-called ‘war on terror’? Why cut off the resource where most of us get news directly from Palestinians & Kashmiris & can organize against attacks & threats to Muslims? Why doesn’t she talk to New Zealand’s war minister to get troops withdrawn from Afghanistan, Iraq, & elsewhere? 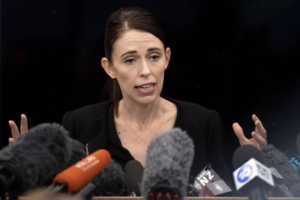 Why doesn’t she denounce New Zealand’s participation in the ‘war on terror’? Why is she going after free speech on social media rather than the US Pentagon? The honeymoon might be over for Jacinda Ardern. Unless you all dump me en masse, I will soon have a readership of 20,000 people. It may be time to get some class & start doing a hoity-toity routine but that is more in the category of fat chance. I don’t take any of you for granted & am grateful for every one of you. Not because you’ve made me popular in some way but because we can work together to make this world a suitable place for human beings to live & love in. I am always humbled by the quality of my friends & by what I learn from you. So thank you more than I can say. The unbelievable courage of this Palestinian kid should not distract us from seeing the monstrous criminality of Israeli snipers repeatedly shooting at him although he presents no harm to them behind wire fence, armored vehicle, & the cover of that mound. The child’s foot was later amputated after being shot by a sniper. 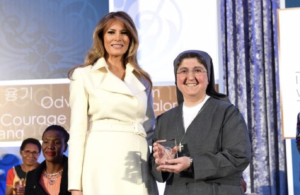 Here’s a piece of news that got past us which makes fools of those who claim the US in on a “regime change operation” in Syria & of those who call for US ‘humanitarian’ bombing in Syria to save the Syrian Arab Spring: this is Melania Trump with Sister Carolin Tahhan Fachakh, a Syrian nun who received the 2017 International Women of Courage award from the US State Department. The good sister with stinking rotten politics told reporters that she “likes” Assad because he’s very helpful & protective of Christians in Syria. She claims there is no truth to reports that Assad used Sarin gas on civilians just the week before she got the award. She didn’t admit that even if the reports were true, it would be no skin off her nose because he was only gassing “Wahhabi jihadi terrorists” who don’t accept the Vatican as their spiritual guide. Can an Assadist or an anti-Assad war monger explain the good sister for us? These International Women of Courage awards from the US State Department are very like the Nobel Peace Prize: worthless. We don’t always have time to vet every fishy smelling news report that comes down the pike but if there’s one about a Christian genocide somewhere, dump it in your waste basket. There are authentic cases of violence against Christians like that against Coptic Christians in Egypt. But during the Egyptian Arab Spring uprising, Muslims surrounded a Coptic church in Cairo that was being attacked to defend it. There were other instances in Egypt of violence against Coptic Christians. Without carefully investigating it, one cannot jump to the conclusion that there is generalized persecution of Christians in Egypt. But if there is, we can be sure it is fomented by the military government to exacerbate social tensions between Egyptians–just like racism is whipped up in other countries to divide & conquer. There are also reports about a crackdown on Christian churches in China. Whatever its scale, human rights advocates of course oppose it. But the Chinese government is not locking up Christians in concentration camps or persecuting them on the same scale as it does Uyghur Muslims. That doesn’t mean abridgment of rights for Christians should not be taken seriously & protested before it escalates. But it should not be exaggerated to shout down the genocide being perpetrated against Uyghur Muslims. Assadists, in an attempt to cover the Islamophobia & anti-Semitism of their ideology, often write about the Christian genocide in Syria. They drag out the Assadist nun Sister Agnes Mariam de la Croix to prove their point, neglecting to mention that the Catholic Church in Syria is fully supportive of the Assad dictatorship. They might better drag out the Syrian Cardinal who supports the Assad regime just as enthusiastically & ignominiously. There is no persecution of Christians anywhere in the world that comes close to the scale of violence against Muslims & the increasing attacks on Jews. Reports about worldwide Christian genocide come from rightwing nationalist white media, much of it Christian media, that wants to vilify Muslims & legitimize the Muslim-hating ‘war on terror’. In truth, most of the genocide is by Christians, not against them. Snopes is not the Bible but this article is a useful source to begin the process of vetting news reports about the latest inflammatory reports of a Christian genocide in Nigeria. Maybe Snopes got it right; maybe they didn’t. But it’s a fishy story & requires a thorough investigation.